Length of employment: As needed by the department, but generally April 15 to September 15. Do you want to educate the public about safe burning practices and changing fire danger conditions? Would you like to inspect permit request sites, issues permits, and pass fire permit locations to lookout towers? If so, a Patrol Person position may be an ideal seasonal position for you. A Patrol Person is required to perform a variety of duties. 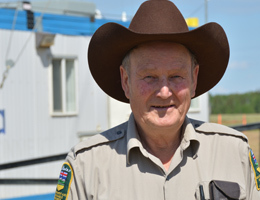 Some of the duties include inspecting fire permit request sites, issuance of fire permits in the Area, educating rural residents about the safe burning practices and changing hazard conditions, and assisting the Area with Wildfire Prevention activities. Issuance of fire permits in the Area and ensures the fire site will be safe and not escape fire permit legal land location. Inspection of permit request sites and approves burning only under safe conditions. Pass fire permit locations to the lookout observers. Educate rural residents about safe burning practices and changing hazard conditions through friendly and courteous contact. Assist the Area with the Wildfire Prevention activities and make recommendations on improving the prevention program. Based on Area and hazard, normal shifts could be a 5/2, 10/4 or 15/6. A vehicle is not required however it is your responsibility to obtain transportation to and from work. While working a vehicle will be available to perform work related duties. Successful completion of defensive driving is required to operate a Department vehicle.